Featuring: Vincent Price, Peter Cushing. Director: Jim Clark. 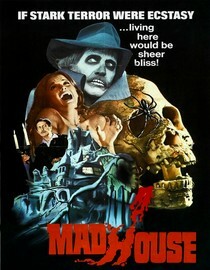 The final Vincent Price film I watched this year was Madhouse. Coincidentally enough, it stars Price as a b-movie horror actor trying to make a big comeback. Where oh where did they ever come up with that premise? Anyhow, people around Mr. Price start dying the same way that people died in the "Dr. Death" movies his character starred in. I loved the premise and thought they could have done some wonderful things with it, but the movie left me a little disappointed. If you want to see Price as an actor killing off people you should probably check out Theatre of Blood, which was filmed the year before. While it didn't live up to my expectations, there are a few creepy moments that you don't want to miss if you're a Vincent Price aficionado. The ending was particularly satisfying and so is the trailer. As you all know, I love 70's b-movie trailers more than Robert Rodriguez. According to Netflix this movie will stop streaming on 5/1/13. Of course, sometimes they lie. Why is it in your queue? Can't have a Vincent Price marathon without a bunch of Vincent Price movies in your queue. What stood out the most to you? The creepy spider lady, you'll know what I'm talking about. What mood should I be in to watch this movie? Macabre.